Smuggling is the most prevalent form of illicit trade in the Philippines due to weak law enforcement and the difficulty of monitoring over 22,500 miles of coastline. Illicit trade hurts economies and undermines democracies, leading to unemployment, price distortions, bankruptcy of local industries, and reduced government tax collection. In the Philippines, smuggling is the most prevalent form of illicit trade due to weak law enforcement and the difficulty of monitoring over 22,500 miles of coastline. 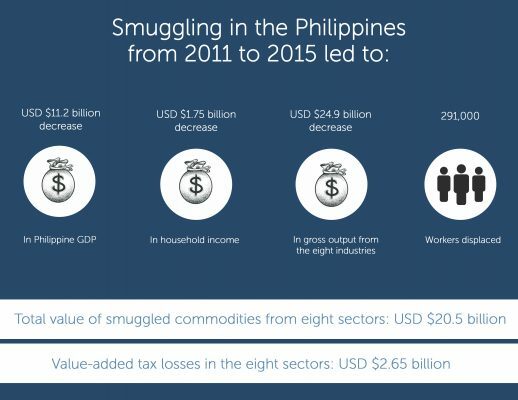 From 2011 to 2015, $20.5 billion (USD) worth of goods were smuggled into the country, according to a study by The Center for Research and Communication Foundation, Inc. (CRCFI), a think tank based in the Philippines and affiliated with the University of Asia and the Pacific. The CRCFI study estimated that 291,000 Filipino workers lost their jobs as a result of illicit trade, which involves illegally importing or exporting merchandise. When smuggled goods replace locally produced goods, local jobs are crowded out of the market. Because of the overwhelmingly negative impact that smuggling has on the Philippines, the CRCFI study calls for the full implementation of anti-smuggling laws to curb illicit trade into and out of the country. 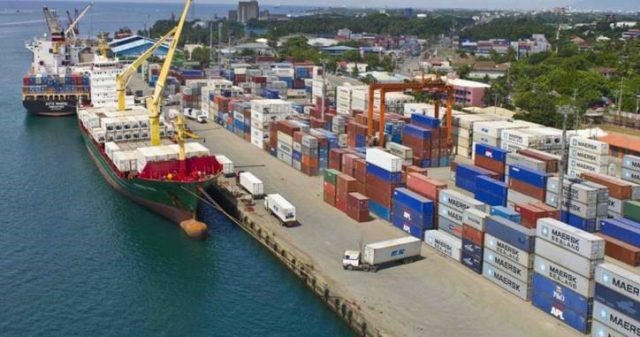 A study by the Center for Research and Communication Foundation, Inc. calls for the full implementation of anti-smuggling laws to curb illicit trade into and out of the country. The problem of illicit trade is a global one. Internationally, the annual estimate for illicit trade has been placed at $870 billion per year, or 1.5% of worldwide gross domestic product (GDP). Illicit trade can be categorized into three areas, according to the World Health Organization: the manufacture of counterfeit products, locally manufactured products that are not tax-declared, and smuggling. Specifically, the trade in counterfeit goods in 2013 amounted to $461 billion internationally and $116 billion in the European Union. Smuggling can be either outright or technical. In an example of outright smuggling in the Philippines’ petroleum industry, fuel is smuggled from tankers in international waters to local supply vessels to bypass import duties; or fuel is smuggled out of Special Economic Zones, where locator firms are permitted to import fuel duty-free as long as it is used within the zone or re-exported. Technical smuggling may involve declaring a lower value of the fuel shipment for tax purposes, declaring a lower volume, or misdeclaration, e.g. declaring a gasoline shipment as diesel to qualify for the lower tax rate. 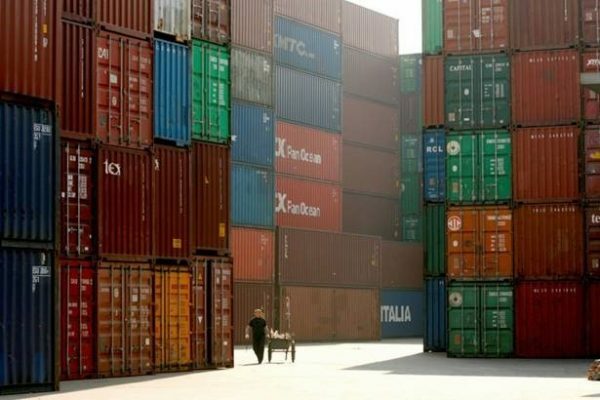 Submission of a manufacturer’s monthly report, where manufacturers submit a complete list of manufacturing and storage facilities for raw materials, semi-finished goods, and finished goods to identify illicit flows. In order to achieve a thriving economy and flourishing democracy in the Philippines, the business community and government officials must work together to enact reforms that curtail illicit trade. Martin Joseph M. Badoy is a Senior Operations Officer with the Center for Research and Communication Foundation, Inc. He is currently taking M.A. Sociology at the University of the Philippines – Diliman, focusing on constructivist structuralism in the context of informal entrepreneurs. 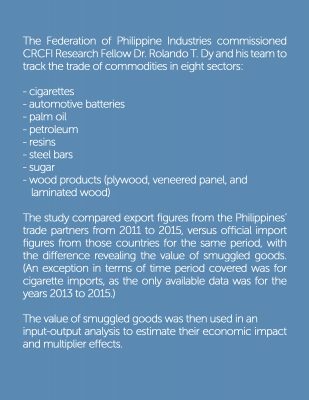 The Multi-Industry Illicit Trade Study was led by Rolando T. Dy, Ph.D., Executive Director of the University of Asia and the Pacific Center for Food and Agri Business. Dr. Dy has conducted agribusiness industry benchmarking, value chain, cost-benefit, and competitive analyses.